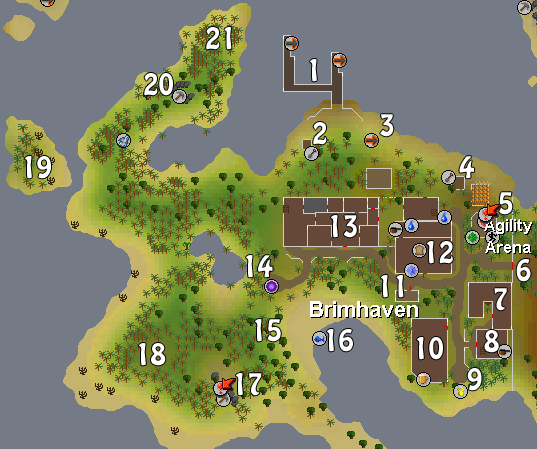 Brimhaven is a small city on the island of Karamja, west of Musa Point. It is home to many pirates! It is only accessible to members. 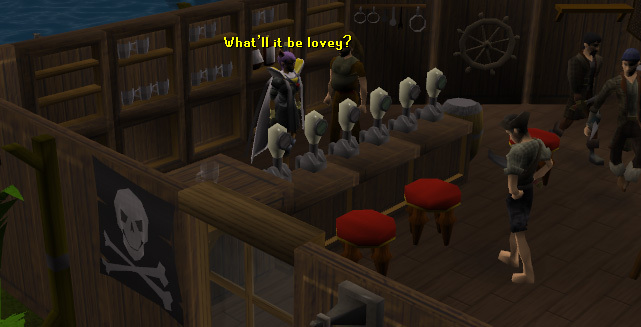 To get here, you'll need to pay 30gp to take a boat ride from East Ardougne to Brimhaven. In addition, you could use an Amulet of Glory and teleport to the banana plantation of Musa Point. 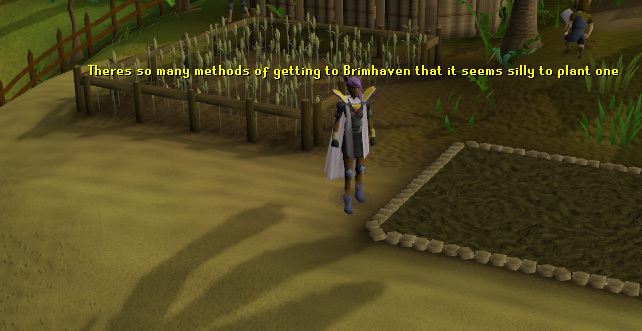 Once you arrive, walk west to Brimhaven. In this city, you can find an Agility Arena, a Player-Owned House portal, Farming Patches, and more. 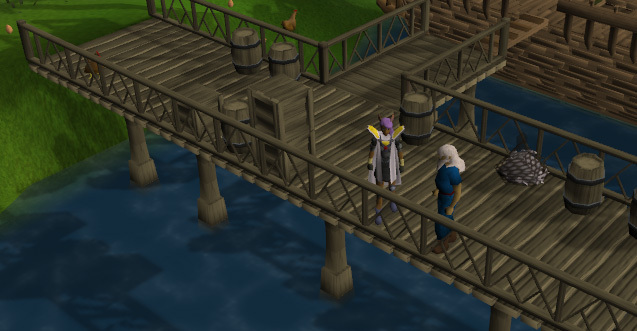 The docks are located at the northern edge of Brimhaven. Here you can find two ships. 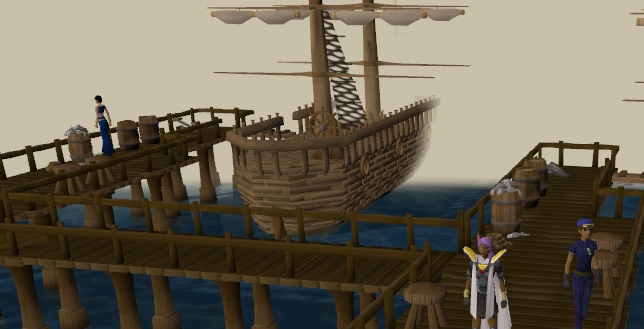 The first ship will take you to and from East Ardougne for a fee of 30gp. Alternately, players who wear a Ring of Charos(a) can charm the custom officers to acquire a free boat ride. The second ship is a Charter Ship. 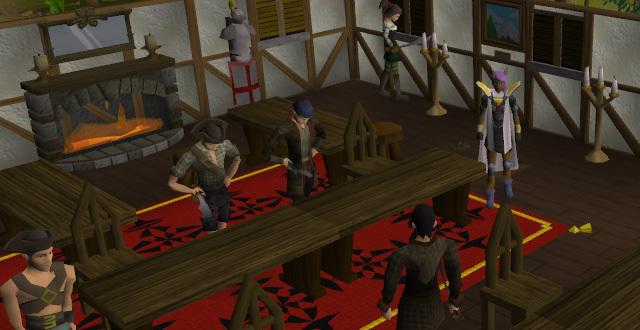 Here you can find Trader Crewmembers who will sail you to other ports around Runescape for certain fees. The Ring of Charos(a) can also be used to reduce prices. They also have a convenient general store with a variety of goods. More information on Charter Ships and their prices can be found in the Charter Ship Travel Guide. A bit southwest of the docks is a Fruit Tree Patch. This patch is used with the Farming Skill to grow fruit trees. You will need a minimum of level 27 Farming to plant anything in the patch. At level 27, the only trees you can grow are apple trees. Wandering around the patch are some level 44 Jungle Spiders. These spiders are aggressive, and will attack anyone with a combat level below level 89. There is also a Tools Leprechaun and Garth. You can withdraw any farming supplies you stored with the Tools Leprechaun. Garth is a professional farmer that will look after your crops, give farming advice, and sell basic farming equipment. East of the Fruit Tree Patch is a travel cart. 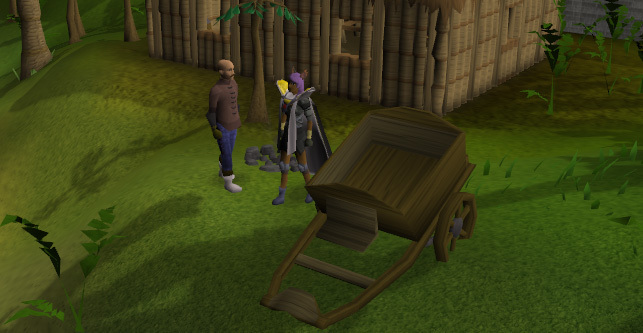 Players who have completed the quest, Shilo Village, can use Hajedy's travel cart for a ride to Shilo Village. There is a fee for using his services. The default price is 200gp. If you do not have 200gp with you, the fee is reduced depending on the amount of cash in your inventory. You will get charged less than the amount you have on you. The minimum price is 10gp. Have less in your inventory and he will not take you. Southeast of the travel cart is a Spirit Tree Patch. Players with level 83 Farming can grow one Spirit Tree in this patch. The patch is watched by a gnome named Prastan Ebola. He can look after your crops, give farming advice, and sell basic farming equipment. South of the Spirit Tree Patch is a house with the entrance to the Agility Arena. 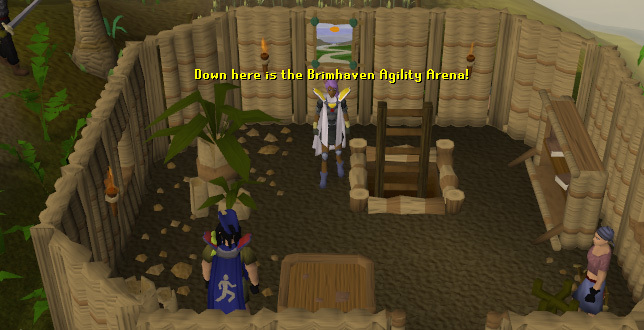 The Agility Arena is a large place to train your Agility level. 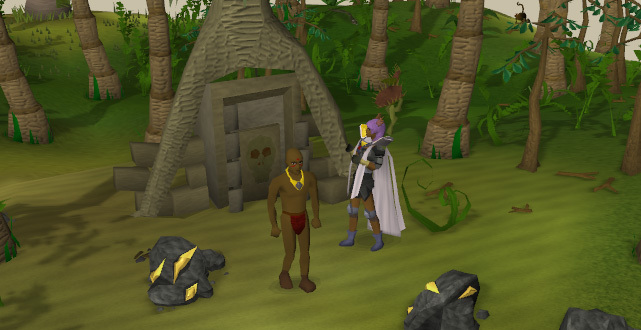 To enter, you will need to pay the owner of the Arena 200gp. You will also need a minimum of level 40 Agility. You can actually enter with any Agility level, however you should be level 40 to get past all the obstacles. There are two NPC's at the entrance of the arena. Cap'n Izzy No-Beard is the first NPC and he is the owner. He will also sell players with level 99 Agility a Cape of Achievement. Cap'n Izzy No-Beard is also part of a Treasure Trail anagram: "O BIRDZ A ZANY EN PC." When you talk to Cap'n about your clue, you get a challenge scroll from the parrot on his shoulder. The challenge scroll will usually ask, "How many trees are in the banana plantation?" The answer is 33. The second NPC is Pirate Jackie the Fruit. She owns a small shop where you can trade in Agility tickets for prizes, such as agility experience and rare herbs. Southeast of the Agility Arena is a gate. 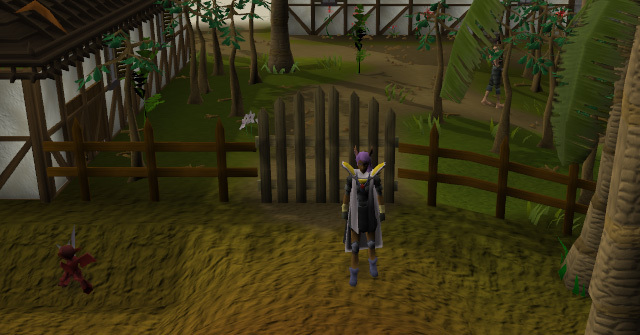 This gate divides the free-to-play and members' areas of Karamja. East of this gate is the free-to-play area, Musa Point. South of the dividing gate is a large house containing two NPC's: Grubor and Trobert. They play a part in The Heroes' Quest. Both of them are members of the Black Arm Gang. Black Arm Gang members are the only people these men with talk with. Anyone part of the Phoenix Gang will not get a reply if you talk to either men. South of the house with the Black Arm Gang members' is a small house with two floors. On the ground floor, there is a cooking range. On the top floor, there are two beds, a set of drawers, and a chest. The chest is used in a Treasure Trail. To open it, you will need to kill a pirate outside for a key. You can open the chest anytime when you don't have a treasure trail, but you need a key to open it when you're doing a treasure trail. Before a pirate will drop a key, you will need to try and open the chest first. Southwest of the cooking range house is Davon. Davon is the owner of an Amulet store. Davon does not stock the store himself, so expect the store to have a zero stock of every amulet. West of the cooking range house is Brimhaven's Pub, The Dead Man's Chest. Inside you can find many level 23 Pirates. These pirates have the options to "Attack" and "Talk-to". There are also three tables, each having item respawns of Beer, Beer Glasses, and a Bronze Axe. Toward the southern part of the pub is the Bartender. He will sell Rum for 27 coins and Grog for 3 coins. North of the Dead Man's Chest is a small building. This building is the Sand Corporations Office. It plays a part in the quest, Hand in the Sand. Inside this house is an NPC named Sandy. He too plays a part in the same quest. 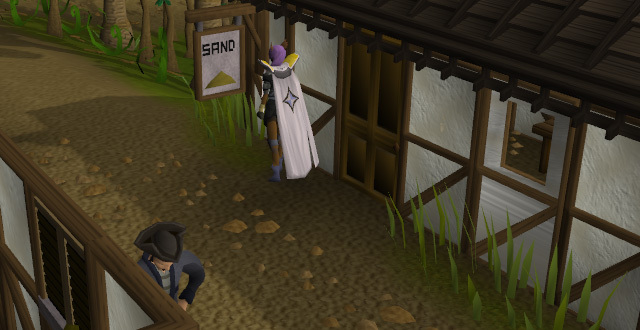 Players who have completed Hand in the Sand won't be able to see Sandy. North of the Sand Corporations Office is the Shrimp and Parrot. Inside you can find some more pirates and Alfonse the Waiter. Alfonse will serve players a variety of fish, for a price. As you may have noticed, there is a quest symbol on your mini-map in this area. Tribal Totem is the quest that can be started by talking to Kangai Mau, found in the restaurant. West of the Shrimp and Parrot is a building containing members of the Black Arm Gang. Specifically, these members include level 19 Pirate Guards and level 22 Grip. Grip plays a part in The Heroes' Quest. He actually gets killed. To enter this building, you need to be a Black Arm member and wear full black. Members of the Phoenix Gang are not permitted inside. 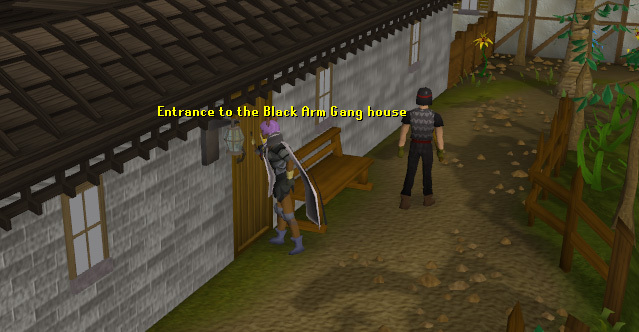 Southwest of the Black Arm Gang house is a Player-Owned House Portal. 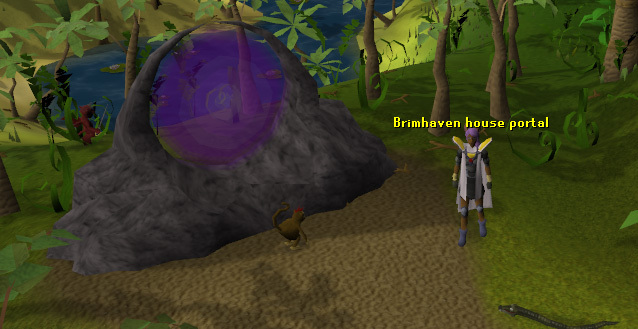 This portal can take you to your house if it is in Brimhaven. You will need level 40 Construction to move your house here. You cannot move your house yourself. You will need the assistance of an Estate Agent. 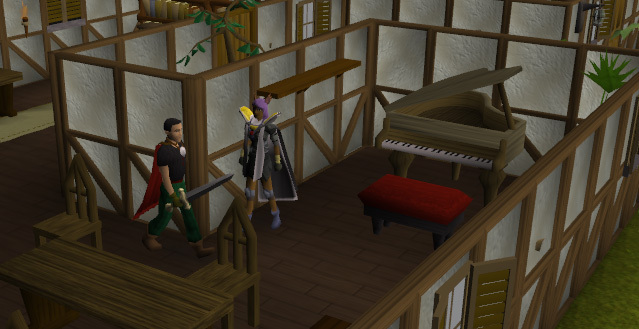 He can move your house, but it will cost 15,000gp for it to be moved to Brimhaven. South of the Player-Owned House Portal are four pineapple plants you can pick fruit from. For those with a house, you can have your servant take pineapples you collect to the bank. This method is a decent way to gather them very fast. 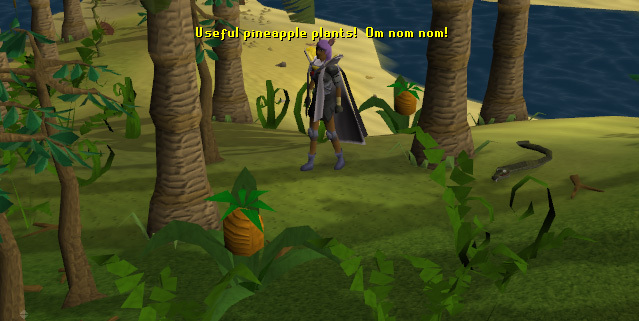 Pineapples heal 80 Life Points and are pretty useful when making super compost for Farming. East of the pineapple plants is an NPC named Lubufu and some fishing spots. Lubufu is a fisherman who plays a part in the quest, Tai Bwo Wannai Trio. 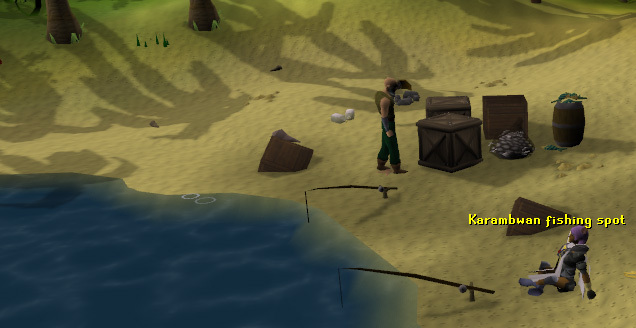 The fishing spots near him are used for fishing Karambwan. 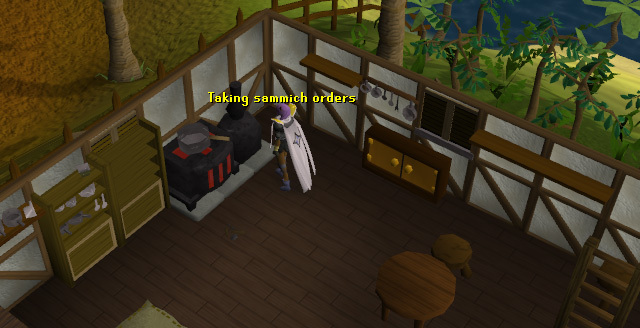 It requires level 65 Fishing to fish Karambwan. 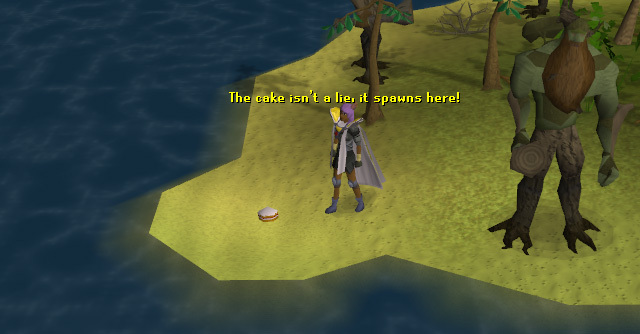 Once you have completed Tai Bwo Wannai Trio, Lubufu will not allow you to use his fishing spots. Southwest of Lubufu is the entrance to the Brimhaven Dungeon. To enter the dungeon, you will need to pay the guard Saniboch 875gp. It is recommended that you wear good armor and carry good food, as the dungeon contains some high-leveled monsters, such as Metal Dragons. Outside the dungeon, you can also find six gold ore rocks. West of the Brimhaven dungeon entrance is a small camp with approximately ten level 32 Tribesmen and a few level 5 Snakes. 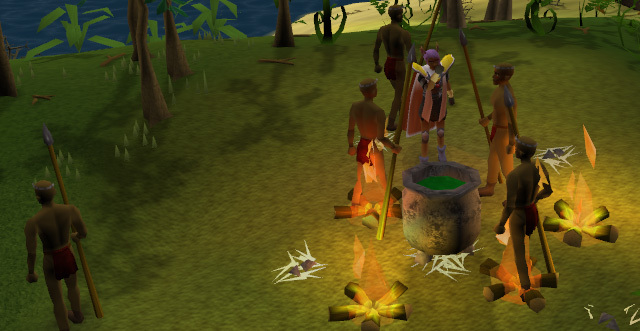 These Tribesmen are aggressive to anyone with a combat level below 65. Each Tribesman carries a spear. Their spears are very poisonous. If you get poisoned, the poison can hit over ten. Northwest of the Tribesman Camp is a small island home to Moss Giants. 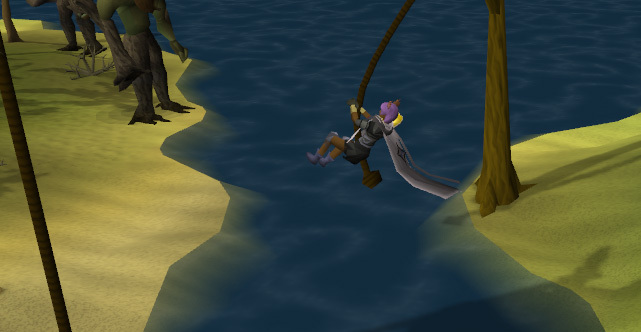 To access this island, you will need to swing on a rope. This requires level 10 Agility. Once you're on the island, you will see five level 42 Moss Giants. These Giants are good for training and they are aggressive to players with a combat level below 85. 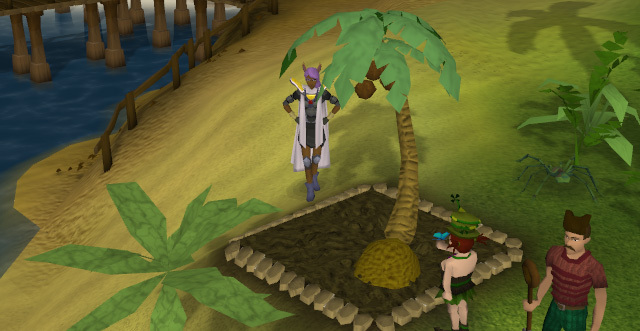 Moss Giant Island is also the location for a Treasure Trail Coordinate clue: 01.26 North 08.01 East. Northeast of Moss Giant Island are ten gold ore rocks. 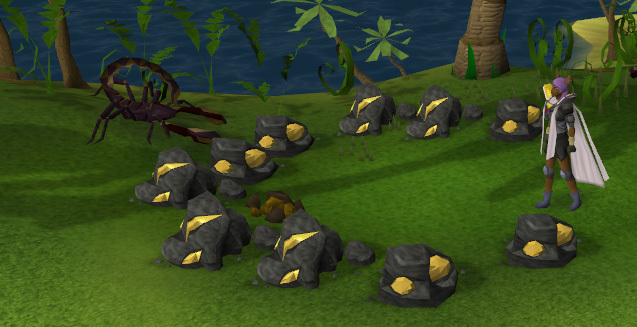 There isn't a nearby bank, so these rocks are not a convenient place to obtain gold ore. The gold ores rocks are also a location for a coordinate scroll: 00.18 South 09.28 East. Wandering around these rocks are level 20 Poison Scorpions. These scorpions are poisonous and aggressive to players with a combat level below 41. Northeast of the Gold Ore Rocks is a watchtower. 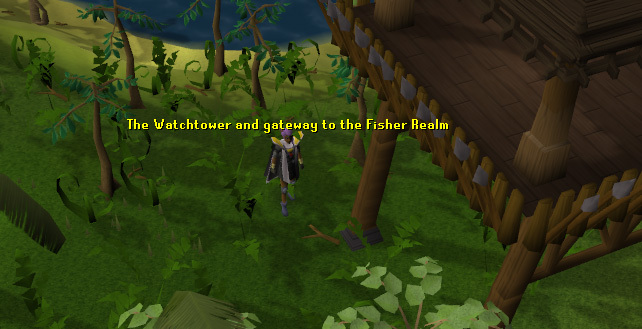 This watchtower plays a part in the Holy Grail Quest. Once you have obtained the Magic Whistle, stand under the tower in the center area and blow the whistle. You will be teleported to the Fisher King's Realm, where you will find the Holy Grail.